Lemon tiramisu is a great dessert to end a very romantic dinner. Yesterday, I served my Valentine a dinner that is reminiscent of our recent trip to Rome. Instead of the traditional ladyfingers in between the layers of mascarpone cream, I used chocolate chip biscotti instead. I flavored the mascarpone cream with Meyer lemons, which paired wonderfully with theItalian chocolate cookies. 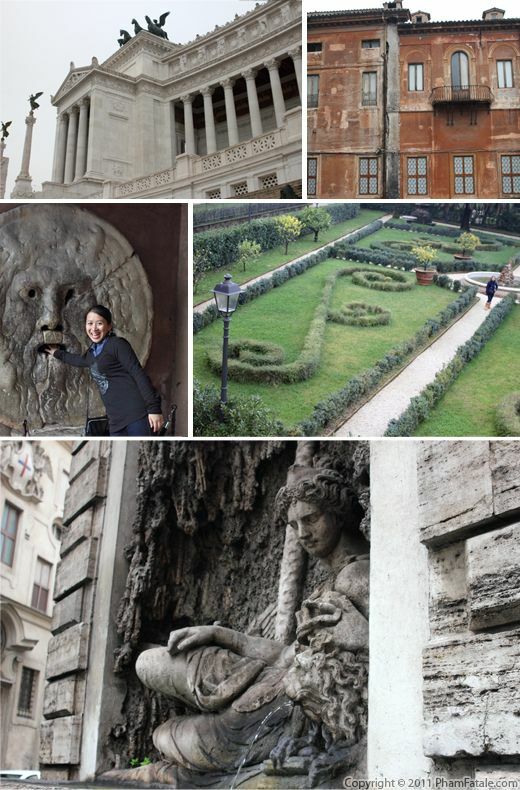 We looked at the photos of our trip to Italy, while feeding each other from the dessert cups. My favorite place was, of course, the Vatican (thanks for the link, Bill!) with its magnificent frescoed ceiling in the Sistine Chapel. Oh so romantic! At first blush, charlotte aux framboises closely resembles an Italian tiramisu. The lady fingers and cream are where the similarities end though. 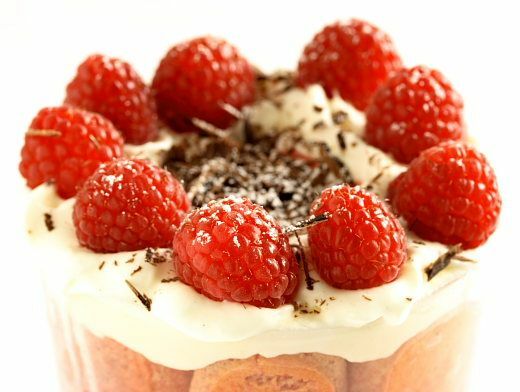 This recipe is made with raspberry extract, fresh raspberries and raspberry sauce. For a more grownup treat, you can use framboise, which is a raspberry-flavored liqueur. Charlottes are traditionally made with fromage blanc, which is a thick yogurt that you can find in any market in France. I didn't have any, so I substituted mascarpone in instead. It's delicious either way. We hosted a dinner party at home this evening. I wanted to make a "summery" tiramisu parfait, as opposed to the "wintry" coffee tiramisu I made in the past. I found some beautiful sweet Maui Gold pineapple and decided to add a refreshing twist to the classic Italian dessert. I added some fresh mint from the garden, some coconut, mascarpone and crème fraîche. I served a wide variety of sweet petit fours and other desserts along with the pineapple mascarpone desserts. I know it was a hit because there wasn't a bit left. When everyone went home, I gathered 14 empty parfait glasses. It looked like the guests washed the dishes themselves. I'm definitely going to make this again! If you're looking for a fast and easy yet elegant dessert recipe, this one is for you. I usually make this dessert to please my little 9-year-old sister-in-law who is allergic to eggs. The rich cinnamon-flavored mascarpone mixture with the refreshing combination of blackberries and blueberries makes a very festive sweet treat for little kids and big kids as well. To give more body to the dessert, I sprinkle a layer of coarsely-crumbled Italian puff pastry and top with a layer of lemon ganache. The result is to die for! 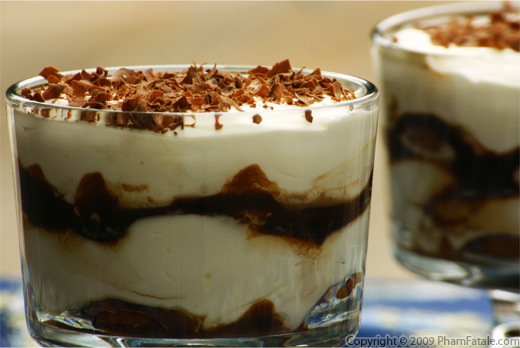 Tiramisu is one of my favorite desserts. The combination of the mascarpone cheese filling with the strong flavor of the coffee syrup is to die for. 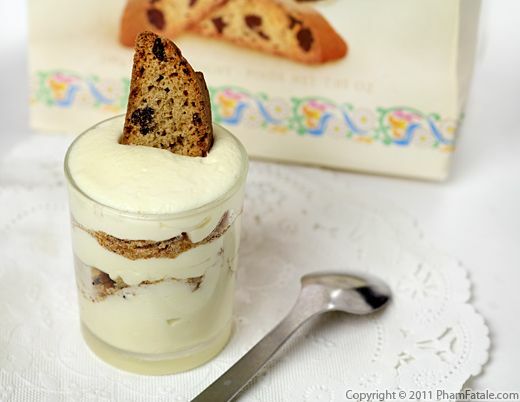 Traditional tiramisu calls for ladyfinger cookies, but I used amaretti cookies because they are small and fit in the parfait glasses without having to break them. I think amaretti cookies are delicious on their own or when paired with an espresso cappucino, but they take on a whole new life when used in this velvety Italian dessert. I prefer making tiramisu parfaits rather than the regular "family style" tray of tiramisu. 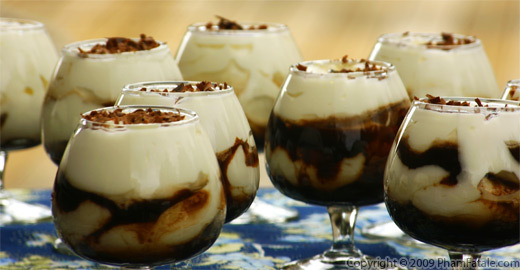 The parfaits are easy to serve if you have a lot of mouths to feed, and they look very elegant whenever served at a formal dinner at home. The small portions will make your guests feel less guilty.